Θα χαρώ να σας γνωρίσω και να σχεδιάσουμε το χώρο σας! Οι μέρες και ώρες λειτουργίας του γραφείου είναι Δευτέρα ως Παρασκευή, 9:30 π.μ.- 6:30 μ.μ. Αν δεν λάβετε απάντηση σε 1-2 μέρες στο email σας, ρίξτε μια ματιά στα ανεπιθύμητα (spam)! You can contact me in English here. Hi, my name is Mania Mavridou. 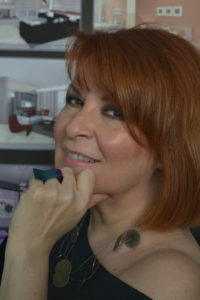 I am an Architect, Interior Designer & Color Consultant, Owner of DesignMania, the Architectural Studio where design meets psychology to create spaces for people to live and work in happily. In 2014 I founded Designing for Happiness, the 1st Greek blog about Interior Design Psychology. Having a rich experience in teaching Architectural Drawing and CAD, Ι now give lectures and seminars on Interior Design Psychology, Color Psychology and Visual Marketing. I also write for Millo, a top American blog for creative freelancers and have been the content curator of The Freelance Report.